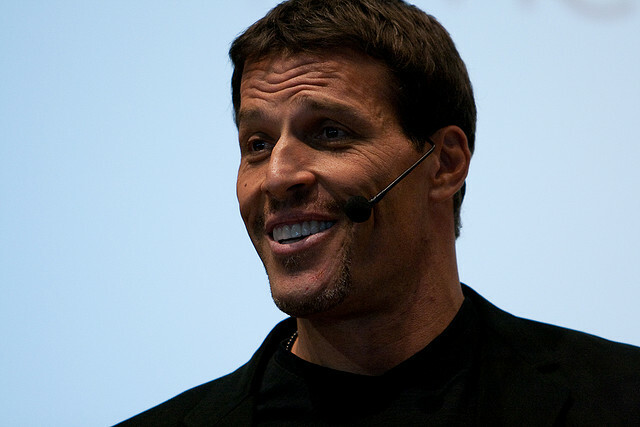 Tony Robbins, the well-known life and business strategist, and bestselling self-help author, has authored books like Awaken the Giant Within, Unlimited Power, and a series of audio and video books. He has managed to inspire people to change their lives, and live a more fruitful life. His talks and shows have garnered him a world-wide following. His mentees include bigwigs like Bill Clinton, Huge Jackman, Oprah, Marc Benioff and many others. Robbins’ childhood was not so pleasant. He had an alcoholic mother. He used to shop, cook, and take care of his siblings. His success story can be traced to his reading habits. In one of his recent interviews, Robbins said,” I started reading As a Man Thinketh and Viktor Frankl’s Man’s Search for Meaning. I get emotional thinking about it today, all these years later. It made me believe that anything can be changed and made better.” So what can writers learn from the legendary Tony Robbins? Read on. Tony Robbins was an avid reader in his childhood. Reading offered him “an escape to get out.” Writers should make it a habit to read. Reading inspires you; it will give you a break from your mundane chores. When you read, you will naturally imbibe the rules of the language, understand the language more, and get ideas to write. All the things that you learn will become a part of your writing experience. Reading a lot of genres aids in triggering your creative ideas that will enable you to write. Robbins says, “Live life fully while you’re here. Experience everything. Take care of yourself and your friends. Have fun, be crazy, be weird. Go out and screw up! You’re going to anyway, so you might as well enjoy the process. Take the opportunity to learn from your mistakes: find the cause of your problem and eliminate it. Don’t try to be perfect; just be an excellent example of being human.” As writers, you may devote a lot of time trying to write. You may or may not complete your writing. Hence, it is important for you take a break to have fun. A pause in your writing does not mean you will stop being a writer. A break enables you to write more productively as you will feel reinvigorated after a break. All of us need some form of inspiration. Writers also need it. There is nothing wrong in finding your inspiration or following what your role model does. In Robbins’ words, ““If you want to be successful, find someone who has achieved the results you want and copy what they do and you’ll achieve the same results.” Think about your favorite writer or think about the person who has inspired you in your life. This person could be your parent too. Reflect on what they have done in your life to make you happy. Use this inspiring person and carve your character(s) in your writing. Our lives go asunder at times, because sometimes we do not focus on what we want. Robbins says, “Most people have no idea of the giant capacity we can immediately command when we focus all of our resources on mastering a single area of our lives.” This applies to writers too. You may have fabulous ideas brewing in your head. But if you do not put them in writing or focus on them, then you will not be able to write your dream novel.